Recolight, the compliance scheme for lighting waste electrical and electronic equipment (WEEE), has funded the recycling of 300 million fluorescent and LED lamps and luminaires since the WEEE Regulations were brought in in 2007, it was announced yesterday (3 September). The organisation, which passed the 200-million lamps recycled milestone in 2014, claims to have recycled more lamps, LEDs and luminaires than all other UK WEEE compliance schemes combined, and has contributed to the increase in the UK’s lamp recycling rate, which has improved from 39.5 per cent in 2012 to 48.5 per cent in 2017. Recolight is also the only UK compliance scheme to run an open collection point network for consumer and business waste fluorescent lamps, offering 3,000 collection points across the UK. In addition to Recolight’s recycling landmark, the scheme is also set to extend its compliance offering to collect more waste electricals covered by the WEEE Regulations. Recolight is exhibiting at RWM 2018 at the NEC, Birmingham, on 12-13 September. The Recolight team will be on stand 4M32 to talk about the scheme’s extended compliance offering. 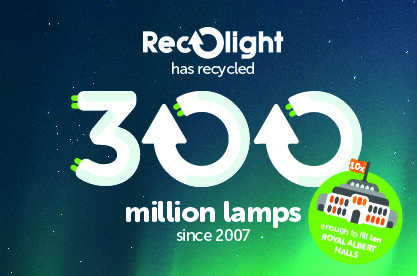 Recolight celebrates having reached the milestone of 200 million lamps recycled.